We understand Children are not just small adults, they have special needs. Whether your child’s situation is routine or complicated, our team will provide the highest level of care to meet the unique needs of your child and will offer compassionate support from the initial evaluation through surgical repair and recovery. Our expert team Assures you that your child could not be in better hands .Thank you for trusting us your most precious Possession. Tonsils are two small glands located in the back of throat. Tonsils house white blood cells to help to fight infection. When the tonsils become infected, the condition is called tonsillitis. Tonsillitis can occur at any age and is a common childhood infection. Tonsillitis Symptoms include a sore throat, swollen tonsils, and fever. This condition is contagious and can be caused by a variety of common viruses or bacteria, such as streptococcal bacteria, which causes strep throat. Tonsillitis caused by strep throat can lead to serious complications if left untreated. How tonsillitis is diagnosed or what are tonsillitis symptoms? Diagnosis of acute tonsillitis is based on a physical examination of throat. The doctor may be take a throat culture by gently swabbing the back of throat. The culture will be sent to a laboratory to identify the cause of throat infection. A mild case of tonsil infection does not necessarily require treatment, especially if it is viral, such as a cold. Pain medicines to relieve the sore throat can help while the throat is healing. Antibiotics will be prescribed to fight a bacterial infection. It’s important to complete the full course of antibiotics. If a person becomes dehydrated due to tonsillitis and swallowing difficulties he may need intravenous fluids. Who Needs Tonsillectomy (tonsils surgery or tonsil removal) ? Adenoids in Children are tonsils like lymphoid tissue at the back of the nasal passage. Like tonsils, adenoids help keep the body healthy by fighting harmful bacteria and viruses that you breathe in or swallow. Although you can see the tonsils at the back of the throat, adenoids aren’t directly visible. Adenoids in kids usually begin to shrink after about 5 years of age and often practically disappear by the teen years. Adenoids in children while fighting the germs and viruses sometimes become enlarged temporarily and get better, but sometimes adenoids can get infected and enlarged constantly and recurrently affecting on the child’s health. 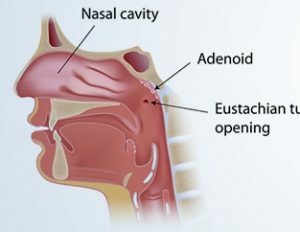 Large adenoids causes nasal blockage and snoring in children and recurrent ear infection in kids, in that case it is recommended to do Adenoid removal. 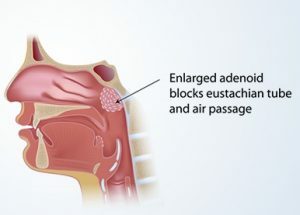 Often, tonsils and adenoids are surgically removed at the same time. Why fluid in ear or ear infection is common in children? 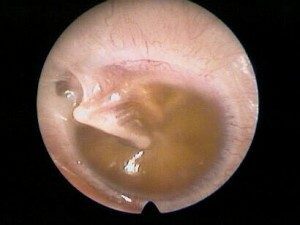 Middle ear is close cavity which needs to be full of air and it is connected with the back of the throat by The Eustachian tube. When the tube opens it allows air to move into the middle ear. Children often develop colds and if the Eustachian tubes become infected, the walls may stick together so the air in the middle ear cannot circulate. Mucus may then be produced, which can fill the middle ear cavity. 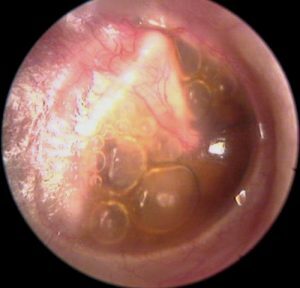 How might fluid in ear affect my child? 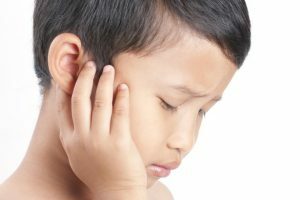 The most common problem are mild discomfort, fullness in the ear and mild hearing loss which last only a few weeks and gets better by itself but sometimes it might go on for many months causing more hearing loss and ear pain in kids. If a young child’s hearing is impaired by fluid in the middle ear, this may delay their language and speech development and may also contribute to behavior problems – such as lack of concentration or attention. How fluid in ear is diagnosed? Should I worry if my child has fluid in ear? What can I do at home to help the middle ear infection or recurrect ear infections to go? Can my child travel by airplane if fluid in ear is present? If the ear is completely full of fluid, there is usually no problem but when the fluid is partial or mixed with air. It can hurt when the plane is coming down. Tympanogram will give flat reading when the ear is completely full of fluid ,visit your doctor to determine that .It may help to keep your child awake when the plane is landing and to encourage him or her to swallow. Tonsillectomy or tonsils surgery is a surgical procedure to remove the tonsils. There are several different ways for tonsils removal. No matter what surgical method doctor chooses, it is done under general anesthetic and takes 45-minutes to 1 hour. The patient won’t be aware of the surgery or won’t feel any pain. When he wakes up after the tonsil surgery, he’ll be in a recovery room. Medical staff will be monitoring his blood pressure and heart. He will usually need to stay in hospital for only one night. Adenoidectomy is a surgical procedure for removing the adenoids can be done alone or with tonsillectomy as per the doctor decision. They are removed through the mouth. It is performed under General Anesthesia .Your Child will be in the operating theatre for between 45 minutes to one hour. 2-3 days after a tonsillectomy you will note an increase in pain in the throat. This is the inflammation settling and the scabs starting to form. The scabs will be white, yellow or green coating where tonsils once were. This is not a sign of infection. Foul breath is normal while scabs are present. The scabbing color can change throughout recovery. It is not normal to have coating on the tongue. Staying hydrated after Tonsillectomy is very important. Even if the patient isn’t eating much at all .as long as they are hydrated this is okay. Signs of dehydration are uncontrollable pain, high temperature headache and nausea and vomiting and lethargic behavior .If you suspect dehydration go to ER at once for IV Fluid replacement. 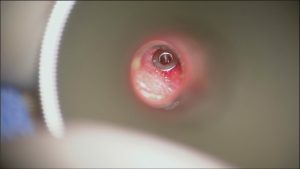 Placing a tiny tube in the eardrum to reduce building fluid in ear that causes hearing loss and as a recurrent ear infection treatment. How long is recovery from tympanostomy and grommet insertion? The surgery is relatively painless and most children are back to their normal selves within a couple of hours after waking from anesthesia. They will be not aware of the presence of the grommet. What are the benefits of tympanostomy and grommet insertion? Relieves fluid and hearing loss promptly and prevents relapse of fluid while the tube is in place and stays open and prevents recurrent middle ear infection. What are the potential risks and side effects of tympanostomy and grommet insertion? About 1 in 4 children get an ear infection (ear discharge) that is treated with eardrops. About 2 or 3 in 100 children have a tiny hole in the eardrum that doesn’t close after the tubes fall out and may need surgery. There is very small risk of serious problems from the anesthesia. What usually happens in the long term after tympanostomy and grommet insertion? Is there any special precautions after grommet insertion?